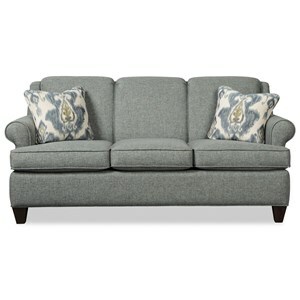 Blend amazing casual comfort and classic details with this beautiful traditional sofa. Three boxed edge seats provide ample room to enjoy a movie with your family or catch up with friends. 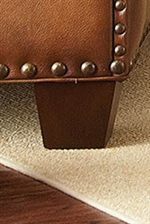 Rolled arms and accent welting exude traditional sophistication, with nailhead trim for added textural detail. 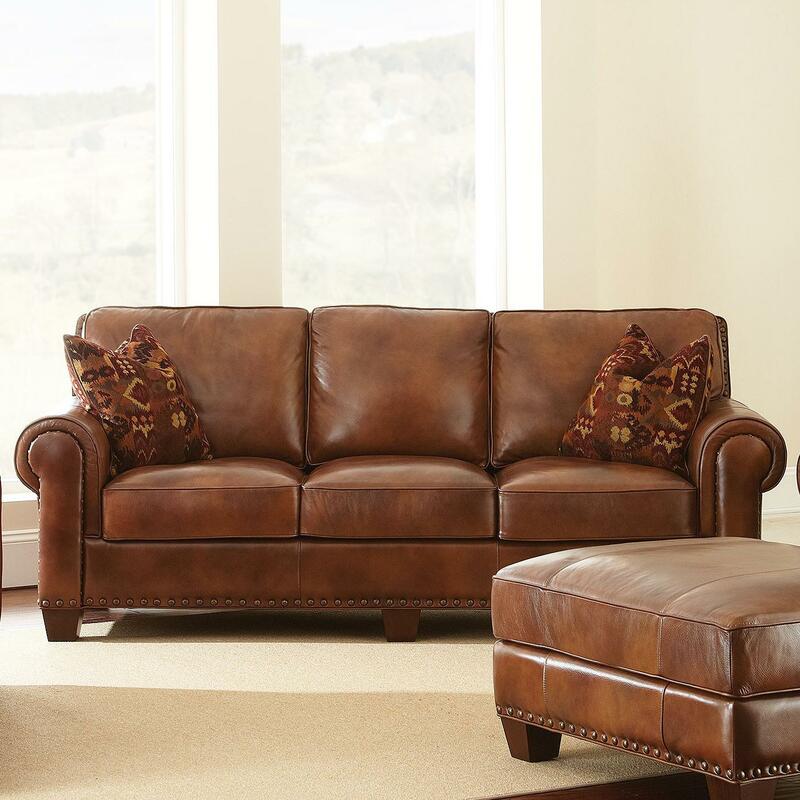 The caramel brown leather upholstery has been perfectly handled for a luxuriously smooth feel, with earthy tones for a truly natural and warm living room or entertainment area. Transform your sitting area with the amazing comfort and rich detail of the Silverado traditional leather sofa. The Silverado Traditional Sofa with Nailhead Trim by Prime at Prime Brothers Furniture in the Bay City, Saginaw, Midland, Michigan area. Product availability may vary. Contact us for the most current availability on this product. Fabric Content 100% top grain/split leather. Fabric Options Caramel Brown leather. Tailoring Eight way hand-tied seats. 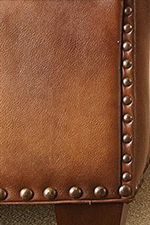 Arm Rolled arms with nailhead trim. Leg or Skirt Tapered block feet. Padding & Ergonomics 2.0 HR foam cushions with pocketed coils. Feather/fiber toppers on seat and back cushions. Enhance you home with the casual comfort and beautiful styling of the Silverado traditional upholstery collection. Complete with a loveseat, sofa, sectional, chair and a half, and ottoman, the collection offers spacious seating and premium comfort, with elegant traditional details sure to appeal to your refined taste. 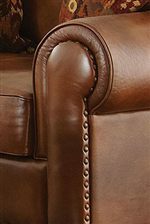 Rolled arms and accent welting balance the plush look of the removable seat cushions, ensuring that while you have the benefit of casual comfort, each piece carries an inherent traditional elegance. 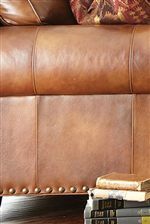 The caramel brown 100% leather upholstery has been perfectly handled for a luxuriously smooth feel, with earthy tones for a truly natural and warm living room or entertainment area. An antique brass nailhead trim decorates each piece for an added touch of texture and traditional detail. 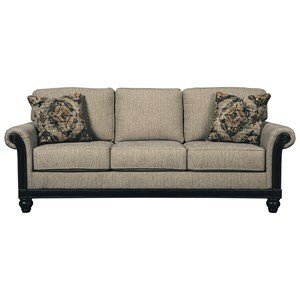 Bring home the whole Silverado collection or take a few pieces for luxurious comfort with refined traditional style. The Silverado collection is a great option if you are looking for Traditional furniture in the Bay City, Saginaw, Midland, Michigan area. 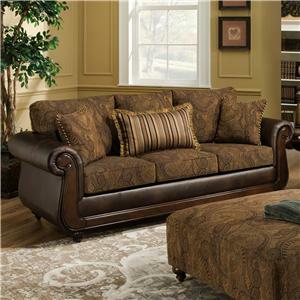 Browse other items in the Silverado collection from Prime Brothers Furniture in the Bay City, Saginaw, Midland, Michigan area.